President Trump delivers a statement on Jerusalem from the White House on Wednesday. "I have determined that it is time to officially recognize Jerusalem as the capital of Israel," President Trump said in a controversial address from the White House on Wednesday afternoon. He also directed the State Department to "begin preparation to move the American Embassy from Tel Aviv to Jerusalem." Trump's announcement fulfills a campaign promise but threatens to unsettle volatile politics in the region. It's a dramatic shift from decades of American foreign policy that called for the status of the city, which is claimed as a capital city by both Israelis and Palestinians, to be decided in peace talks. The declaration also breaks with long-standing international practices; no nation has an embassy in Jerusalem. 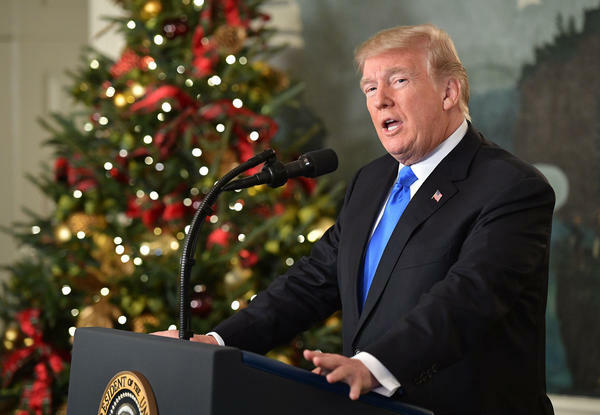 Trump said previous U.S. presidents have "failed to deliver" on pledges to acknowledge Jerusalem as the capital of Israel. "I am delivering," he said in a speech that began shortly after 1 p.m.
"Today we finally acknowledge the obvious," he said. "This is nothing more or less than a recognition of reality." The president says his announcement does not mean the U.S. is taking a position on any possible future peace negotiations between Israelis and Palestinians or on the "final status" of Jerusalem after such talks. Trump later signed an official proclamation to recognize Jerusalem. That proclamation also stated that the president "is prepared to support a two-state solution to the dispute between the Israelis and Palestinians" and that the specific boundaries of Israel are subject to negotiation between the two parties. For decades, world powers — including the U.S. — have refrained from taking sides in that dispute by locating their embassies in Tel Aviv and avoiding any reference to Jerusalem as a part of Israel. In 1995, Congress passed a law calling for the U.S. to recognize Jerusalem as the Israeli capital and for the embassy to be moved to Jerusalem. But every president since then has chosen to waive that law, putting off implementation six months at a time. Trump was expected to extend that waiver, while also initiating plans to move the embassy eventually. "Moving the embassy was one of Trump's campaign promises as he appealed to pro-Israel voters, including many American evangelicals. "The White House insists the Jerusalem policy change does not lessen the chances for reaching peace between Israelis and Palestinians. Officials said regional leaders contacted before the decision were committed to encouraging a peaceful solution. But the administration also took precautions. "The State Department issued warnings to diplomats in the region that protests could break out in the region following a change in policy on Jerusalem." Before the announcement was formally released, several key leaders in the Arab world warned that it would be a dangerous move that would threaten peace talks, as NPR's Scott Neuman wrote this morning. "There will of course be disagreement and dissent regarding this announcement," Trump said Wednesday. "But we are confident that ultimately, as we work through these disagreements, we will arrive at a place of greater understanding and cooperation." "The United States remains deeply committed to helping facilitate a peace agreement that is acceptable to both sides," Trump said. "I intend to do everything in my power to help forge such an agreement." "Deadly riots targeting Jewish communities erupted in 1929 over the city's most contentious holy site, known as the Temple Mount to Jews and the Noble Sanctuary to Muslims. Recognizing the religious sensitivities, the United Nations proposed a partition plan in 1947 that created two separate states but called for Jerusalem to be under international control. "Following Israel's capture of East Jerusalem in 1967, the city's borders were redrawn, tripling its size. Some 200,000 Jewish Israelis have moved to the eastern side of the city and a small number of Jewish nationalists have established residence within traditionally Arab neighborhoods. "Arab residents of East Jerusalem typically do not participate in municipal elections, so as not to recognize Israel's sovereignty over the city. The two communities have little social interaction." The status of Jerusalem, a city containing sites sacred to Judaism, Christianity and Islam, is "probably the most combustible issue in the long-running Israeli-Palestinian conflict," as we wrote yesterday. Critics from around the globe have denounced Trump's proclamation as detrimental to the peace process, though Trump emphasized in his statement that the decision "is not intended, in any way, to reflect a departure from our strong commitment to facilitate a lasting peace agreement." After Trump's speech, a prominent Palestinian exiled politician, Mohammed Dahlan, said on Twitter that the decision is a "historic mistake" that breaches "the principle of inviolability of the status of Jerusalem." He called for an end to cooperation with the U.S. Some Jewish groups in the U.S. celebrated the move, while others denounced the timing as premature and likely to create fresh conflict. Israeli Prime Minister Benjamin Netanyahu thanked the president for the "historic decision," saying his nation "will be forever grateful." "So far, not a single country other than Israel has thrown its support behind the declaration," The Associated Press notes. It's not just nations standing in opposition. Christian leaders in Jerusalem warned Trump that a change of policy in Jerusalem "would cause irreparable harm." United Nations Secretary-General Antonio Guterres called this a "moment of great anxiety" and emphasized that "there is no alternative to the two-state solution." And Pope Francis, in an address delivered before Trump's speech, expressed "deep worry" over the upcoming U.S. policy change, according to a Reuters translation. He made a "heartfelt appeal" for everyone to respect the status quo in Jerusalem and prayed that "wisdom and prudence prevail, in order to avoid adding new elements of tension to a global panorama that is already convulsed and marked by so many and cruel conflicts."